Our Gift for Joining the Victoria VIP Club! We have a 23-page Victoria and Vancouver Island Travel Guide waiting for you! 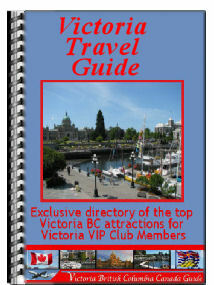 It's chock full of the Victoria BC information you need to plan your vacation here. All you'll have to do is join our VIP (very important people) mailing list and we'll tell you how to download our FREE PDF directory that lists all the restaurants, all the attractions, activities, the gardens, the special tours and services that Victoria British Columbia has to offer. The Victoria and Vancouver Island Travel Guide is in PDF format, which can be read by anyone with a computer, whether it's a MAC or a PC. You can print it out and bring it with you too! We'll give you the addresses and phone numbers (you can't have your laptop with you ALL the time). Just print it out, throw it in your bag and off you go. You don't have to remember anything, take copious notes or remember our recommendations because everything will be right there in our free directory. AND! Look for the specials and coupons businesses are offering in the Victoria and Vancouver Island Travel Guide. Save yourself some money while you're having fun. Thank you for your interest in joining our VIP mailing list and in the free Victoria BC information we have for you. What else do you get for joining the VIP mailing list? Well... from time to time, we'll send you email notices about upcoming events in Victoria that we think you might be interested in. Our VIP members will also be eligible for special travel and sightseeing deals we are privy to. Later on, we may start a free monthly email newsletter too (ezine). VIP members will have first chance to subscribe. All you have to do to get started is to fill in your email below and we'll email you the link for your FREE 23-page Victoria and Vancouver Island Travel Guide! Join the Victoria VIP Club!